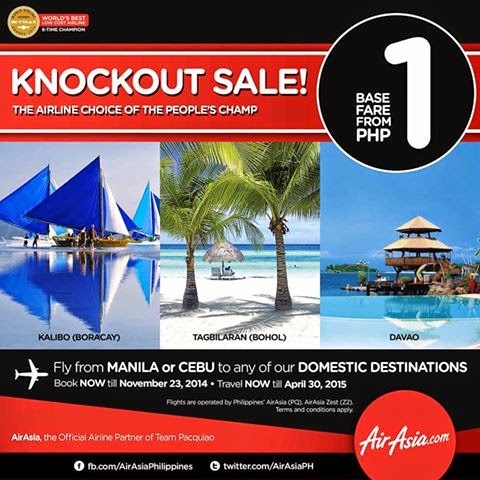 Piso Fare Promo 2015: AirAsia Zest is introducing a knockout sale of P1 base fare! AirAsia Zest is the airline choice of the People's champ, Manny Pacquiao! Make the most of your Christmas and Year-End bonuses! Book the cheapest tickets you can have with AirAsia Zest. Base stations of the Php 1 promo is MANILA or CEBU to any domestic destination! We give you from as low as P1 base fare to our domestic destination! 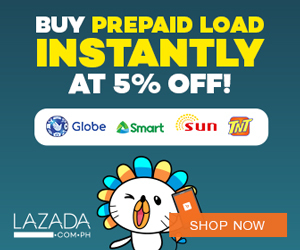 Fly to/from Manila, Cebu, Kalibo, Puerto Princesa, Tagbilaran and Tacloban these coming holiday season or Fly/to Cebu to Cagayan De Oro or Davao! Book now at http://bit.ly/AAKnockOutSale or via your smartphones when you download the AirAsia Mobile App! ‘Share’ this with your family and friends and wrap up this year with a vacation that you’ve been waiting for!